Firstly, new pianos are a special case; their pitch drops quickly for the first few years as new strings stretch and wood parts settle. It's very important that a new piano be maintained at proper pitch (A-440) during this period so the string tension and piano structure can maintain a stable equilibrium. Most manufacturers recommend three to four tunings the first year, and at least two annually after that for the next few years. Aside from the initial decade of settling, seasonal changes are the primary reason pianos go out of tune. 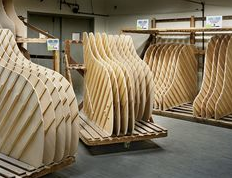 To understand why, you must realize that the piano's main acoustical structure, the soundboard, is made of very soft wood (typically 3/8-inch thick Sitka Spruce). While these types of wooden soundboards produce the best sound, they also react constantly to the weather. 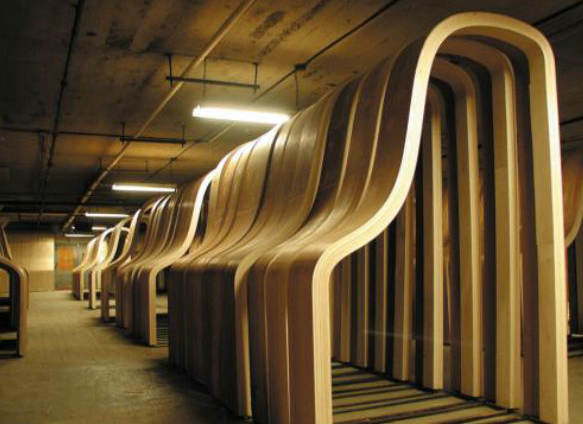 As humidity goes up, a soundboard curve or crown swells, elevating its dimensions and stretching the piano's strings to a higher pitch. During dry times, the soundboard crown flattens out somewhat, lowering tension on the strings and causing the pitch to drop. This is most noticeable in the Tenor section. 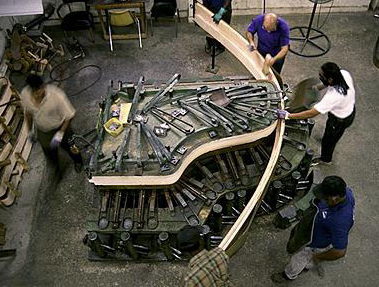 The crowned shape is essential to creating the best tone, and is carefully engineered and monitored during the piano's construction. Unfortunately, strings don't change pitch equally. Those near the soundboard's edges move the least, and those near the center move the most. Since they are not in hermetically sealed chambers, all pianos are constantly going out of tune! The good news is there are some simple things you can do to keep your piano more stable between service appointments. It's impossible to prevent every minor variation in indoor climate, but you can improve conditions for your piano. By locating the piano away from direct sunlight, drafts, heat sources, and external walls, you will save it from excess stress. Heating causes dryness, so try to keep the temperature moderate (at or below 70 degrees) during the winter heating season. In climates with very cold, dry winters, a portable room humidifier can help, or install a central humidification system to combat winter dryness. A portable dehumidifier or a dehumidifier added to your air-conditioning system can remove excess moisture during hot, muggy summers. If controlling your home's environment is impractical and it is in the more extreme climate areas, and you want the best protection possible, there are humidity control systems that can be installed inside your piano. Generally I don't think this is necessary in the Bay Area. These are very effective in controlling the climate within the instrument itself. Besides improving tuning stability, they help minimize the constant swelling and shrinking of your piano's wooden parts. The critical part of such a system is the humidistat, a device that monitors the relative humidity within the piano and adds or removes moisture as needed. Care should be given to not put the heater bar close or directy below any plastic parts, such as "elbows". Jars of water, light bulbs, or other "home remedies" have no controls and might do more harm than good. What does the Oldest Known Piano sound like? Built in 1720 soon it'll be 300! 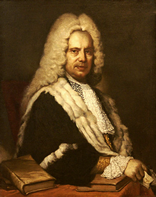 Unfortunately, the very first instrument created by Bartolomeo Cristofori was lost. 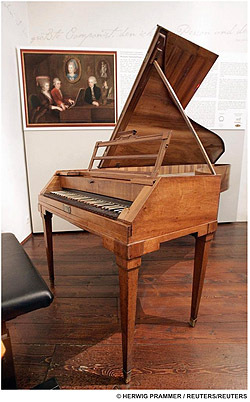 Fortunately, the oldest piano now in existence was also made by Cristofori, 1720. Listen to this video (from www.cmuse.org) and you'll hear how amazing it sounds! He is believed to be the first composer to write music for the piano. From the 12 Sonatas by Lodovico Giustini published in Florence in 1732. Video from Jun 6, 2013 • Production support: The Donna and Marvin Schwartz Foundation. • increases the repitition characteristics of upright pianos to rival the grand piano action. • increases the hammer bounce-away speed making the notes sound more grand-like. 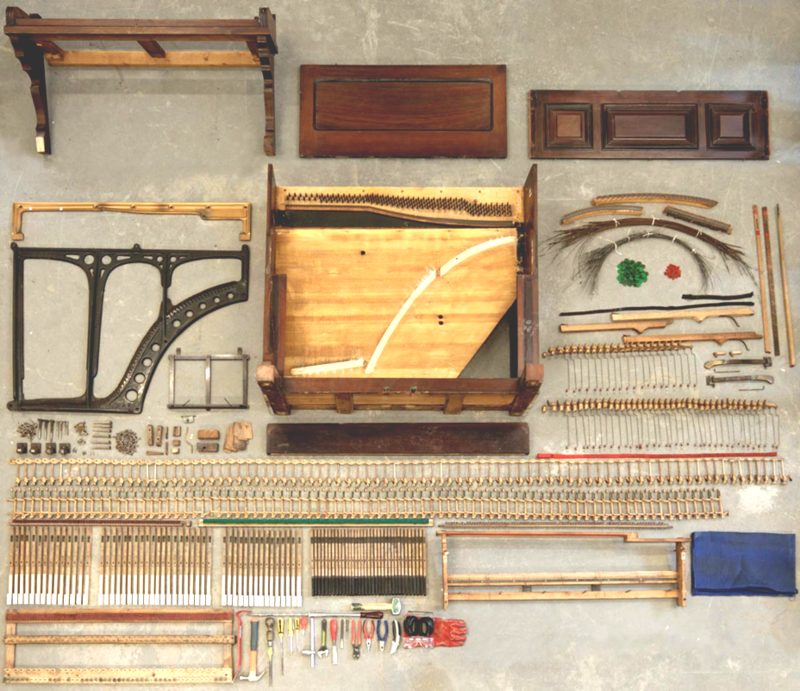 The modern piano is an amazingly complex iron and wooden machine with over 5 thousand parts, myriad felt covered wooden pieces and 220 to 250 strings, all built inside an iron structure that perfectly sustains an average of 20 tons of tension. That's 40 thousand pounds, the weight of the average house!! In the early 1700's an Italian harpsichord builder named Bartolomeo Cristofori produced a big technological advance, a new mechanism for the harpsichord giving it the ability to be played with expression, the dynamic ability to achieve variations in the loudness of individual notes. This touch-sensitive invention was called in Italian: "Gravicembalo Con Piano E Forte," … "Harpsichord With Soft And Loud." ...Notice "Piano" originally meant "Soft". Written music soon included expression, notated with P or F and doubled or tripled by the composer. Since the 1400s, there have been two dominant keyboard instruments most widely used. 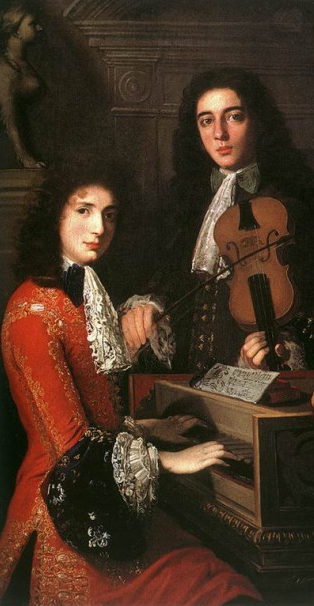 The clavichord and the harpsichord both had their own strengths, and were popular for specific venues and music styles. They eventually led to the invention of the piano. Clavichords are constructed with two strings per note [bi-chord] that are struck by brass hammers called "tangents" attached to the end of each key. As a key is depressed, the tangent struck its two strings and remaining in contact would act as a fret, causing the note to play. It set the string in motion at its correct speaking length. Varying of the pressure on the key would create vibrato. Dynamic expression was also possible on the clavichord, but the range of volume was limited to the mezzo-piano level, or about as loud as an acoustic guitar. However they were extremely popular in domestic use and remained so for 400 years. 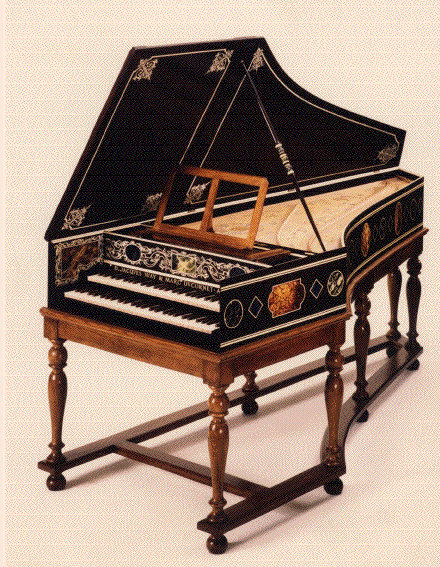 Harpsichords date from about 1505, and were popular during the same period and had there own followers. Harpsichord strings are plucked by a quill or plectrum. A felt damper rises off the string, allowing the string to vibrate freely when plucked. Volume could be altered for all notes at once by adjusting parameters of quill alignment and coupling with multiple sets of keys, so the harpsichord had a higher volume than the clavichord. This made it especially popular in churches as it could be played with organ and singers and still be heard. A third instrument, also a forerunner of the piano had no keyboard. The dulcimer, a multi-stringed instrument is struck with hand held padded hammers. In 1690, German player and showman Pantaleon Hebenstreit designed a special one. It was four times the normal size, nine feet long with a giant soundboard. He made special two-sided hammers for striking the strings, one side for soft and the other for loud. This was a great success for Hebenstreit, but required his high-level unique skills to play. It did not develop commercially, yet provided another link for the piano. For this new instrument's hammers, he combined a small roll of parchment glued to a pad of leather fitted into a wood molding. His "escapement" invention allowed the hammer to hit the string yet escape rather than stay touching the string. This action, unlike the clavichord, allowed strings to vibrate freely. Years passed before the invention was made public, but in 1709 an Italian journalist named Scipione Maffei visited Cristofori, and published drawings of the design two years later. Instrument builder Gottlieb Silbermann saw the drawings and built his own version. J.S. Bach praised Silbermann's work, and endorsed it in the 1740s. A separate and distinct English style of action arrived in 1766. In the next 20 years there were two schools of piano making, the Viennese, and the English. By then Maffei's article had been translated into several languages and many builders experimented the with Cristofori's action. The Viennese instruments had lighter weighted and simpler mechanisms. Composers such as Wolfgang Amadeus Mozart were excited by their great responsiveness musical expression. In 1777, Mozart wrote to his father praising Johann Andreas Stein who perfected the Viennese action. This style of action was popular until 1905. The English builders increased volume to the sound by adding iron bars to the wooden framework. Strings could now be made heavier. Still, these action designs, while satisfying the need for greater volume, were limited in repetition. From the late 1700s to early 1800s, instrument builders in both schools continued to improve the mechanics and the structures of their products. But no one had the impact of Cristofori until a Parisian named Sebastian Erard invented the "double escapement" or repetition mechanism. This revolutionary idea, patented in 1821, made it possible for a hammer to hit the string again before the key was returned to its original position, making rapid repetition possible. By then, composers such as Franz Liszt were writing music with greater speed, power and expressiveness. Larger venues and concert halls brought about louder orchestras. Instrument builders throughout the late 1700s and early 1800s continued the quest for more volume and dynamics. Strings became heavier, adding tension to the frame. Iron bars were added to the wooden timbers of the cases, the whole structure becoming stronger and heavier. 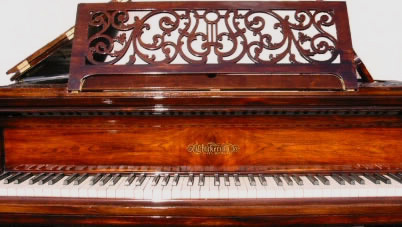 In 1825, a quantum change occurred with the American piano make, Alpheus Babcock, who patented the full cast iron plate for the square piano, completely removing the tension from the wooden case. Boston's Jonas Chickering further developed Babcock's idea with the full iron frame for the grand piano. The innovations came fast and furious. 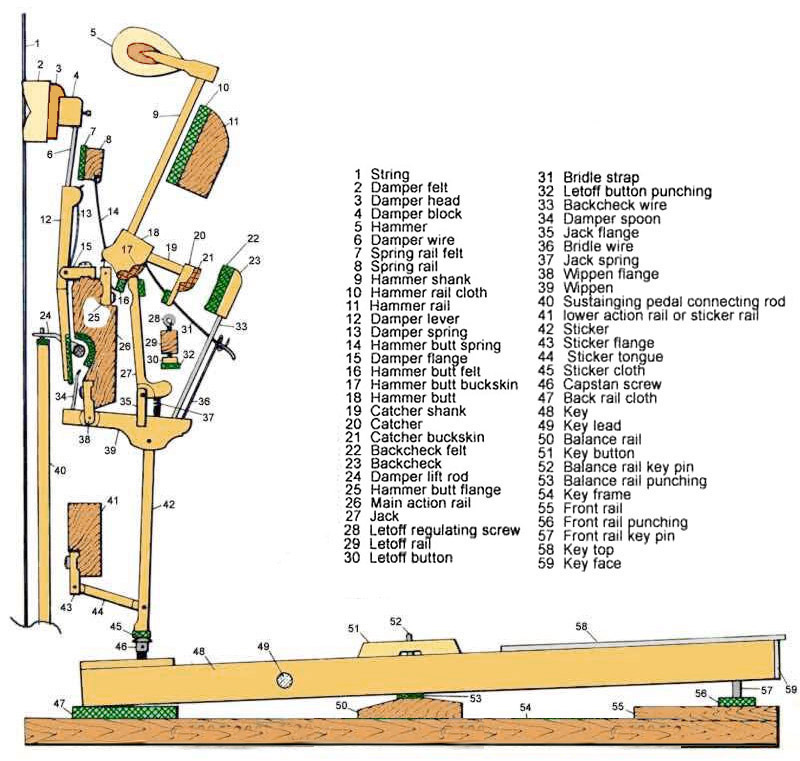 Mechanized factories were under way in Europe and America. 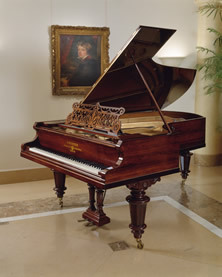 Piano styles ranged from rectangular boxes to wing-shaped grands and uprights. They incorporated improvements in structural integrity, strength and volume. Having all the strings running parallel was still a limitation. 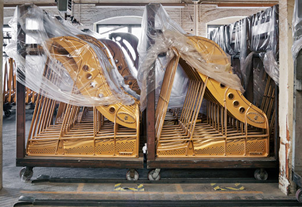 In 1859, Steinway produced the first overstrung grand piano where the bass strings cross over the other strings, creating an even bigger sound. By 1870 they were close to what we know today. Since 1895, technology in the piano has hardly changed. From just a few thousand in 1850, by 1909 sales rose to well over 300,000 . Which Pianos were favored by the famous composers? Mozart (1756-1791) bought his perhaps final instrument (on right) from Anton Walter, the most famous Viennese piano maker of his time, in 1782. 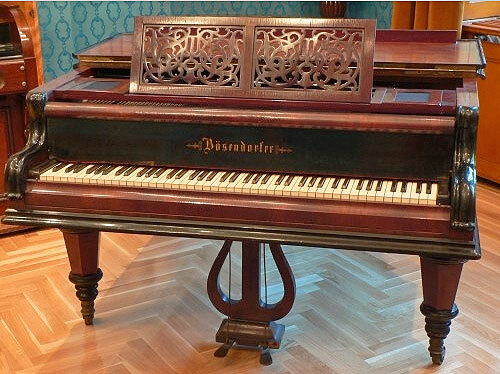 The piano on which Mozart wrote all of his late concertos, Mozart played this piano almost daily for nine years stands in his former Vienna home, now a museum. Chopin (1810–1849) once remarked "Pleyel pianos are the last word in perfection." Now music fans can hear what the composer's music would have actually sounded like in his own salon. 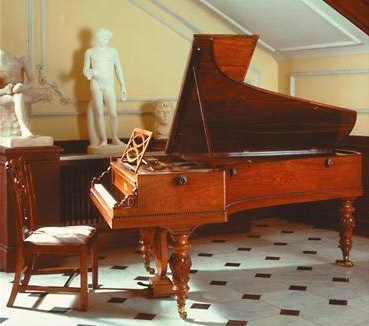 Pictured on left, Chopin's piano is part of the Cobbe collection of musical instruments displayed at Hatchlands, a country house run by Britain's National Trust in the southern English county of Surrey. There are only three other pianos known to have been possessed by Chopin. One is in Paris and one is in Majorca and neither of those work. Liszt (1811-1886) toured the capitals of Europe, performing at best guess more than a thousand times, during the 1840s and early 50s. The quality he looked for was for ones that did not fall apart when he played in concert. This was a chronic problem for him! 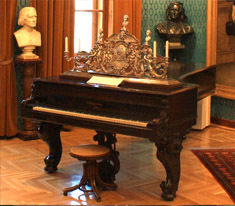 At his museum are two Chickering pianos and a Bösendorfer piano. 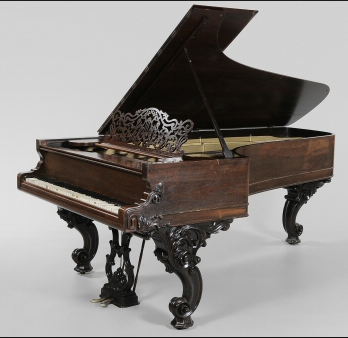 At this writing, there's a piano on exhibit at the Metropolitan Museum in New York, manufactured around 1865 by the French company Erard, a grand piano was owned by Liszt during the last 15 years of his life and was used by him primarily for composing and teaching. Today's pianos are often featured in our homes as pieces of furniture as much as (and often even more than) a musical instrument. Sonically, because of thicker strings, iron frames, and a more even and forceful volume, they may also correspond to a tonal ideal - i.e., sometimes a somewhat percussive quality - crystallized in the minds of composers like Stravinsky, Bartok and Prokofiev, and exemplified in their piano music. A price, however, has been paid for this kind of "progress." Modern pianos can lack the bell-like transparency of a Mozart piano, the greater softness and yet power of the basses of a Beethoven piano, or the dreamy tenderness of a Parisian salon Chopin piano. 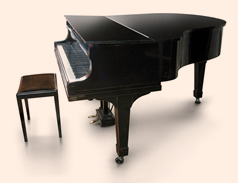 Since 1980, the demand for upright pianos has declined by almost 90%. But, at least untill the economic downturn in '08, grand pianos were fairly steady. Of particular interest to pianists is that these principles have changed during the piano's history, creating different intonational "eras" in keyboard music. 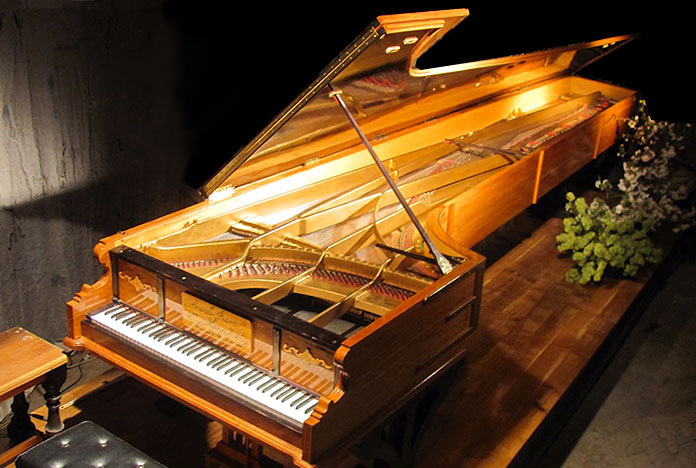 During the past 300 years, pianos have been tuned in three significantly different styles. This recording surveys the piano's harmonic evolution via six different temperaments from one of these eras. Before 1700, Renaissance and Baroque keyboards were tuned so that some intervals were very consonant (also called "Just" intervals) and others totally unusable ("wolf" intervals). With permutations, this tuning lasted from approximately 1400 to the early1700's and is now known as Meantone tuning. The wolf intervals limited composers to certain keys, so it was a "restrictive tuning". Pure harmony is quite expensive from a modulatory point of view. Meantone's use on the earliest pianos is likely, and even though it was used on organs into the 1800's, its dominance faded with the end of the Baroque era. Between 1700 and 1900, temperament became non-restrictive, but not quite "equal". All keys could be used, but some offered more harmony than others. The importance of modulation in Classical and Romantic keyboard music proves that temperaments with wolves in them were not in use. What is becoming obvious today is that keyboard compositions of this era make strong use of "key color"3, a quality found in the tunings called now called "Well Temperaments". 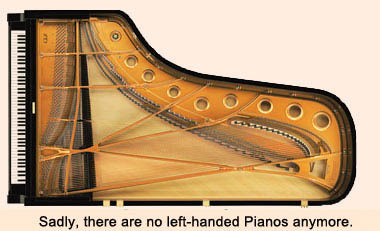 20th Century pianos were tuned almost exclusively in Equal Temperament, creating a sameness to the keys' tonal characters that is unavailable in any other tuning. It is this total and democratic allotment of dissonance that makes Equal Temperament useful as a universal tuning, but at no small cost. The price of convenience is the loss of historically recognized tonal variety and contrast known as key color, or "The Character of the Keys". As the 21st century begins, Equal Temperament is under energetic review. 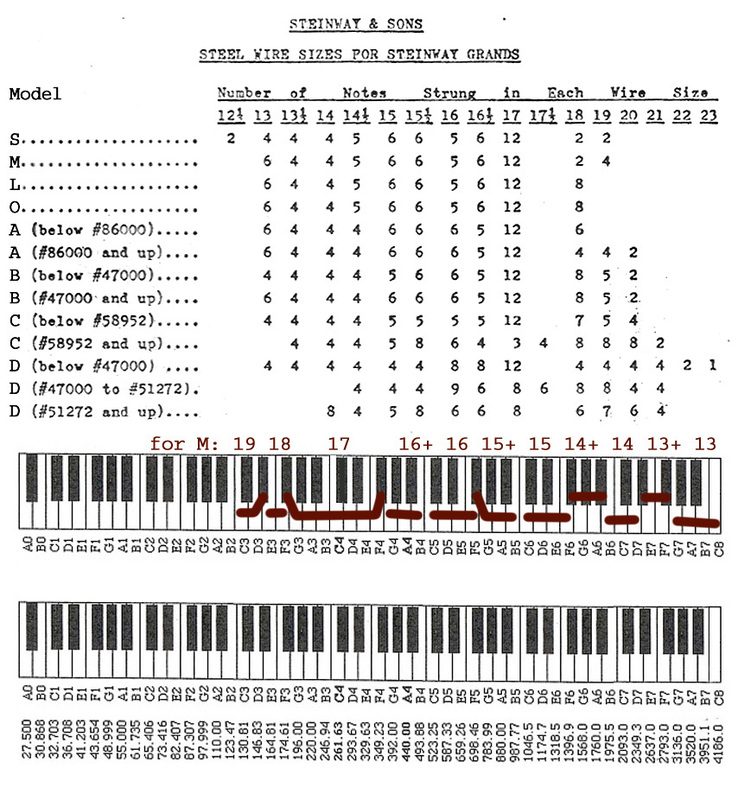 The source of this examination is a combination of two factors: the programmable tuning computer for piano technicians and the research of Owen Jorgensen at Michigan State University. Research by Jorgensen and others strongly indicates that from 1700 to1900, the age of Bach, Mozart, Haydn, Beethoven, Chopin, Brahms, et al, a style of tuning was in use that was more complex than those which came before or after. The Well Temperaments of this period differ profoundly from Meantone or Equal. Not only do they allow full modulation, they create a predictable variety of consonance and dissonance, providing an acoustical palette of tonal "colors" for the composer's use. Keyboard compositions written during this period appear to make use of harmonic values which do not exist in the other temperaments. The evolving art of modulation, the development of sonata form with its harmonic rules, and the known emotional-affective nature of tempering variety, all indicate the use of a commonly accepted form of well tempered keyboards. Not only do the Well Temperaments provide tonal contrast, they also offer a higher degree of consonance than is available in Equal Temperament. They can, when called upon, be far more "in tune" than today's norm. (By the same technique, if the composer desires, they can produce sounds as dreary and tense as a funeral dirge, it all depends on the choice of key). An article by John Stuart Reid called the 'Concert Pitch Conflict' provides a comprehensive history of tunings and there's reference to many of his findings here. Greek philosopher and mathematician, Pythagoras (570–495 BC), is often credited with identifying musical harmonic ratios related to scientific pitch and the birth of A = 432 Hz tuning with his instrument called the monochord. It is believed, however, that instruments built accordingly to harmonic ratios were used in Egypt and Greece well before this time. The earliest instruments were flutes and lyres, often used for therapeutic purposes. Hundreds of years later during the classical periods of western music, it was documented that composers like Mozart and Verdi used the A = 432 Hz tuning. Verdi believed it was a much better tuning for Operatic voices. In the late 19th and early 20th centuries, 432 Hz tuning was challenged by other countries like Germany, the US and Britain who all seemed to be using and experimenting with different pitches. In the early 20th century, there was a need to make a universal pitch standard used by all for sake of instrument makers, composers and orchestras everywhere. Even though 432 Hz was fully supported by the French and Italian composers through most of the classical music periods, 440 Hz eventually became the universal pitch standard. German Physicist Johann Heinrich Scheibler invented a device called the Tonometer and did the first experiments with 440 Hz tuning in the mid 1800s. The Tonometer consisted of 54 tuning forks with a range of 220 Hz to 440 Hz spaced at 4 Hz intervals. His work became widely recognized and a conversation began about a standardized tuning. After much debate, the US adopted 440 Hz as the standard in 1936. Europe soon followed with its adoption many years after it was first proposed on both continents. Even today, many musicians believe that music played in 432 Hz tuning has a better audience response, has a calming effect and sounds more integrated overall. It is still not entirely clear why 440 Hz was chosen. It seems the scientific experiments by Scheibler had a lot of influence on this choice as opposed to what tuning may have been more in line with the harmonic ratios and relationships found in nature. I can't help but notice how the music of India and the rest of Asia were left out of this discussion entirely. It is a testament to their unique musical and healing traditions that are affecting us more and more today. 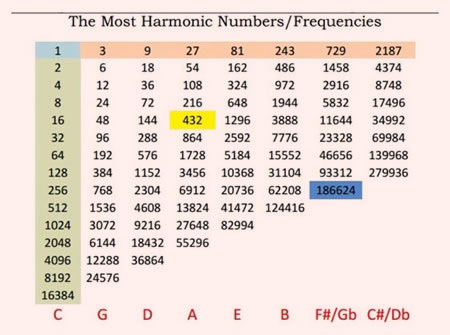 Mathematics, Nature and Frequency The chart below shows how 432 Hz tuning is derived based on Pythagorean harmonic ratios. Multiples of 2 and 3 forms the basis of the chart, and the left column shows all the multiples of 2 as the note C. In the middle, you will see that A=432 Hz. Also of note is the number 108, used in many spiritual traditions as a unifying number. Mala prayer beads come in strands of 108 and in yogic traditions, 108 sun salutations are often practiced. The number 186624 in the blue box is 432 squared and is the frequency of the speed of light within hundredths of a decimal—very close! Also, every column corresponds to a note with each being a 5th apart. You will recognize this as the Circle of Fifths—the basis for music theory, or at least Western music theory. if a break occurs at tuning pin. What's at the heart of an excellent tuning? These particular measurements were taken on note A3. But each string on a piano has at least the first half of these harmonics [except the soprano section]. 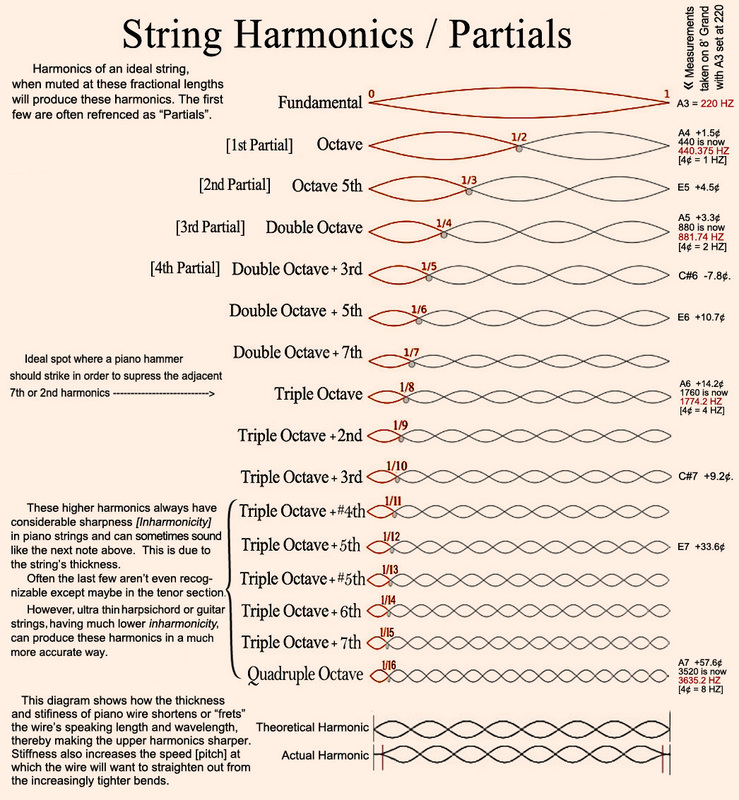 Due to universal "Inharmonicity", all string's harmonics get sharpened at various measurable amounts. The best tuning creates the optimum compromises for determining the "stretch" from octave to octave. The goal is for each upper octave to resonate with the pitches in the lower octave's harmonics. To do so they need to be accurate within 1¢! ...And each piano will have quite different results. Once this is achieved, the piano will have a magical quality that will provide maximum sustain and resonance. "Protek Center Pin Lubricant" for sluggish action centers causing the dreaded "Frozen Hammers"
especially on Steinway actions from around the 1930's and others pianos with frozen or slow parts. down-weights of 45-60 grams yeild light to heavy touch. 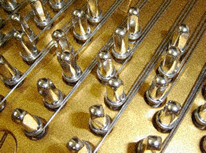 To compensate, the tradition has been to install lead weights into drilled holes inside the keys. This allows lead to come into repeated contact with the player's fingers!! Now considered a toxic hazard. Lacquer could be used to create a clear-coat, or wood-colored paint. We're experimenting with adhesive add-on wheel balance weights placed on the bottom of the keys. Sources for Screw-on type Lead Weights: 30.2 gr. Comes with screws. The tradition is to get them to swing 3 times, as one can see, the friction is way less than 1 or 2 swings. But 4-8 swings is not much less and the possibility of rattling or clicking becomes problematic. "A touch weight of Downweight/Upweight = 50/20 would have a BW = 35 and F= 15. This is spec for a concert performance, 50 g in the bass tapering to 46 g in the treble. Keeping a consistent BW of 35, then the treble touch weight would be 46/24 (35 BW, 11 F - if friction is 11g). At a 12 F = 47/23; 9 F = 44/26. DW & UW are separated from BW by F.
Use BW as a target because the UW/DW will vary (spread) with seasonal change in F.
A touch weight of 40/23, BW = 31.5, F = 8.5. Removing lead from the front of the key to bring the BW to 40 and the touch becomes ~49/32, F stays the unaffected. A BW below 35 starts to become featherweight and uncontrollable. 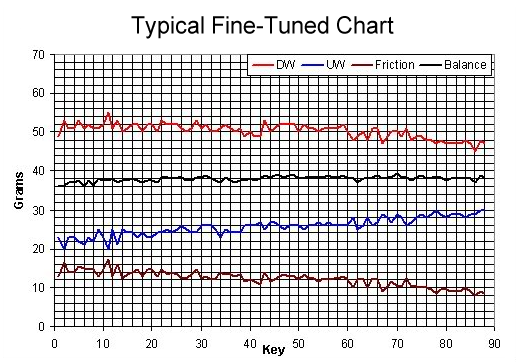 Friction typically ranges from 15~16 g in the bass to around 10 g in the treble. Typically actions are setup with BW between 38 and 42. 38 being a lighter action, 42 being a heavier action. Above 42 and the actions feel too heavy. Actions with Friction approaching 20 or above are sluggish. with F dictating how low can be the BW to maintain at least 20 UW in the bass." A comment from PianoWorld Forum: "Arledge strings are wound on an automated machine in an implementation of Baldwin's expired patent. The plus is the ability to perhaps control the longitudinal component of the string vibration." ...This vibration is the most irritating one in my opinion! Re: "Frozen Strings" ...consensus was that no differences could be either heard or measured (using quite sensitive measuring equipment) that could be attributed to the cryogenic treatment. Most piano manufacturers sell more than one line of pianos. For example in addition to their name brand, Steinway also sells pianos under Boston and Essex.